Biochemists have long known that crucial cell processes depend on a highly regulated cleanup system known as proteolysis, where specialized proteins called proteases degrade damaged or no-longer-needed proteins. These proteases must destroy their specific targets without damaging other proteins, but how this orderly destruction works is unknown in many cases. Now researchers in Peter Chien’s group in the department of biochemistry and molecular biology at the University of Massachusetts Amherst report finding how an essential bacterial protease controls cell growth and division. Lead author Kamal Joshi, a doctoral candidate in the Chien lab, conducted experiments in the model bacterium Caulobacter crescentus. 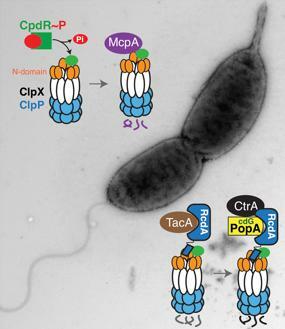 In this species, the ability to grow and replicate DNA is regulated by ClpXP, a highly conserved protease that in many bacteria allows them to cope with stressful environments such as the human body. Understanding how ClpXP is controlled could open a path to antibiotics that inhibit harmful bacteria in new ways. Further, Joshi found that these newly identified regulatory adaptors worked in a step-wise hierarchical way. The first adaptor was directly responsible for degrading a handful of proteins, but it could also recruit an additional adaptor that would deliver a different set of proteins and bind even more adaptors. Working with the Viollier lab from the University of Geneva, Switzerland, the researchers found scores of additional protease targets that were destroyed in this hierarchical way. The researchers believe this new fundamental knowledge may offer an entirely new target for developing new antibiotics with a high potential to avoid triggering drug resistance. This is because new compounds could be devised which would not simply target all bacterial growth, but only a specific pathway, such as virulence.